I had heard a lot about Dead of Night before watching it. It is a much-loved British film that makes it on to many ‘best of horror’ lists. To be honest, I was pretty convinced I was going to love it. Tell me it’s an influence for Twilight Zone and I’m sold. But it’s the right era of film I like, and I do love a well-done anthology. But with most things that are heavily hyped, it’s almost always a disappointment. 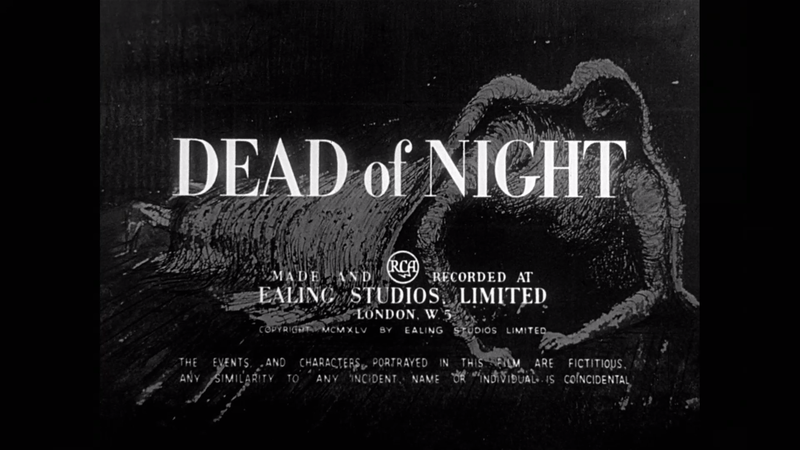 Dead of Night is pretty entertaining in it’s separate parts, but doesn’t work completely as a whole. The framing story revolves around a group of people at a farm a house belonging to a psychologist. An architect arrives, saying he already has seen the people and the house in his dreams. The man, Walter Craig, continues to unsettle the people by making predictions that come true. Psychologist Elliot Foley doesn’t believe Craig, so the other guests share their own stories of the supernatural. A race car driver tells his story of how a ‘dream’ of a man in a horse-drawn hearse saved him from getting on a bus that crashes. A young girl talks about seeing a ghost at Christmas. There’s a story about a haunted mirror that possesses others, and one about a man who haunts his former-friend after they argue over a woman. The last story is probably the most creepy just because it’s about a ventriloquist and his dummy. Everyone hates ventriloquist dummies, and this is probably a source of that all. There’s a nice twist at the end, which makes watching the entire film worth it. I personally enjoyed the race car driver’s story the best. The hearse bit reminded me of Burnt Offerings, so it’s pretty easy to see how influential this film was. The golf buddy story is pretty silly. It’s comedic tone doesn’t blend very well with the others. There is some very good atmosphere at times, but doesn’t carry through the entire movie. It’s a classic for a reason, though. And I imagine it will impress and entertain most classic movie fans. For me, the biggest sin was failing to make me feel anything at all.